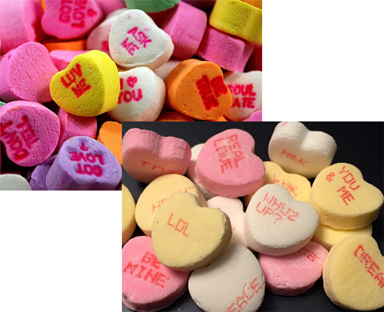 I remembered chunky bright multicolored candies with little sayings stamped on them. These were thin and pale with sayings printed on them — printed, as in dot-matrix and many of them misaligned. Objectively I get it. When TEXT ME is more relevant than CALL ME (or LOL instead of CUTIE PIE) it’s easier to change what gets printed than it is to fabricate new molds. I’m having a cranky codger moment here. If you can make something cheaper and with less effort, who cares as long as it still serves the same purpose? How about anybody who appreciates a little bit of craftsmanship? And why am I grousing about candy on a gospel choir blog? Because it reminds me that I appreciate things crafted with care. Because singing in this gospel choir has shown me how wonderful and well-crafted some of the old gospel music is. But for this water my Lord had to die. I wouldn’t let my dear Savior in. I’ll take one of these thoughtful codger songs any day over much of contemporary Christian praise music. There’s nothing wrong with praise music; it just doesn’t suit my taste, building up the committed followers while gospel music calls to those (myself included) finding their ways. Most praise songs strike me as lyrically shallow, repetitive, and vaguely manufactured. Kind of like speed-printing PTL on a chalky candy wafer rather than stamping AMEN into something tasty.